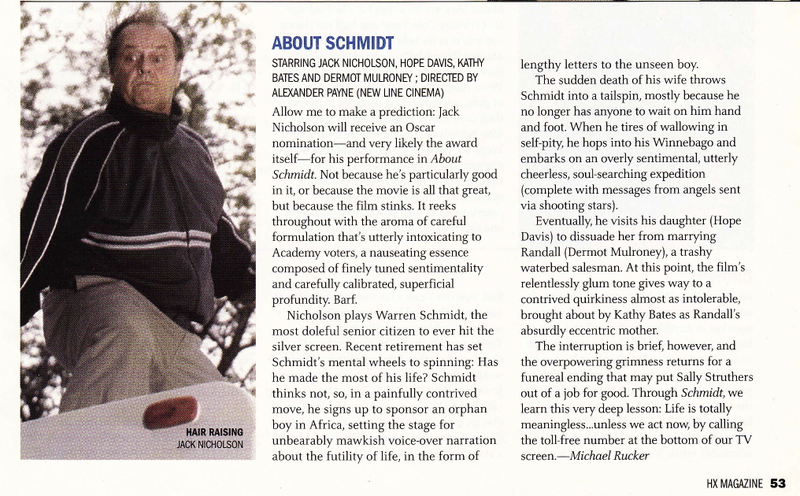 Allow me to make a prediction: Jack Nicholson will receive an Oscar nomination – and very likely the award itself – for his performance in About Schmidt. Not because he’s particularly good in it, or because the movie is all that great, but because the film stinks. It reeks throughout with a carefully formulated aroma that’s utterly intoxicating to Academy voters; a nauseating essence composed of finely tuned sentimentality and carefully calibrated, superficial profundity. 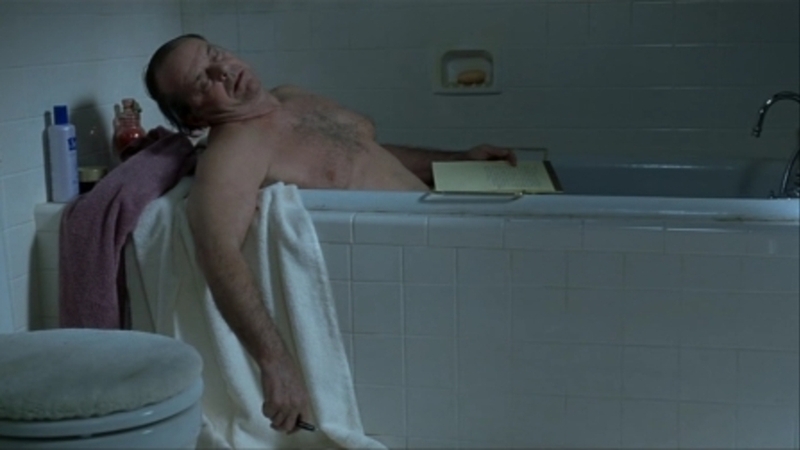 Nicholson plays Warren Schmidt, the most doleful senior citizen to ever hit the silver screen. Recent retirement has set Schmidt’s mental wheels to spinning: has he made the most of his life? Schmidt thinks not, so, in a painfully contrived move, he signs up to sponsor an orphan boy in Africa, setting the stage for unbearably mawkish voiceover narration about the futility of life, in the form of lengthy letters to the unseen boy. The sudden death of his wife throws Schmidt into a tailspin, mostly because he no longer has anyone to wait on him hand and foot. When he tires of wallowing in self-pity, he hops into his Winnebago and embarks on an overly sentimental, yet utterly cheerless, soul-searching expedition (complete with messages from angels sent via shooting stars). Eventually, he visits his daughter (Hope Davis), hoping to dissuade her from marrying Randall (Dermot Mulroney), a trashy waterbed salesman. At this point, the film’s relentlessly glum tone gives way to a contrived quirkiness almost as intolerable, brought about by Kathy Bates as Randall’s absurdly eccentric mother. The interruption is brief, however, and the overpowering grimness returns for a funereal ending that may put Sally Struthers out of a job for good. Through Schmidt, we learn this very deep lesson: life is totally meaningless…unless we act now, by calling the toll-free number at the bottom of our TV screen.